Can I Quit Cold Turkey on My Own? 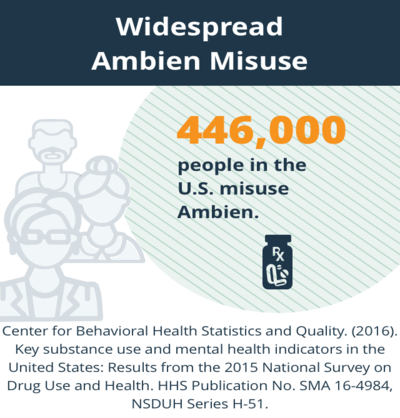 An estimated 446,000 people in the United States were current misusers of Ambien (zolpidem) and other sedatives in 2015.1 A dangerous dependency to Ambien can develop after just 2 weeks of use. Don’t attempt to quit without proper knowledge and before putting a medical treatment plan into place. Treatment for Ambien addiction typically begins with a medically assisted detox program where your Ambien dosage is gradually decreased, or tapered, over time. After tapering down slowly, you can stop taking Ambien with minimal risk of experiencing potentially dangerous withdrawal symptoms. For some people, this process may take only a couple of weeks. For severe users, the successful completion of detox – including full resolution of associated withdrawal symptoms – may take several months or even longer. Stopping Ambien cold turkey or without medical care can be dangerous (see “Can I Quit Cold Turkey on My Own?” section below). Users can experience withdrawal symptoms, seizures, or other medical complications. The safest approach is to work with a medical professional who has experience tapering people and dealing with withdrawal. A formal detox is frequently combined with various forms of behavioral therapy, counseling, and/or support group participation. With these approaches, you and a therapist begin identifying psychosocial features that contribute to your addiction. The therapist teaches you coping skills to help manage stress and limit other maladaptive behaviors. Inpatient rehab centers: Residential treatment programs provide you with structure and routine to help you establish healthy sleep habits. 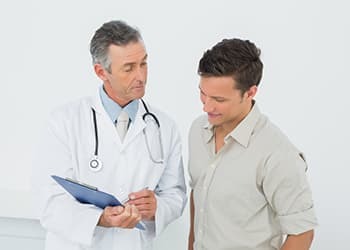 Inpatient Ambien addiction treatment usually lasts between 30 days and 90 days and may include medically assisted detox, counseling and support groups. Outpatient rehab centers: Some cases of mild to moderate Ambien addiction are managed with outpatient treatment. This form of addiction treatment allows you to maintain your home and professional life. Some outpatient programs can usher you through a formal detoxification while providing some combination of individual and group therapy. Group counseling: Support groups and group therapy programs can aid in recovery and prevent relapse by providing a strong peer support system. Individual therapy: Therapy for Ambien dependence addresses the psychological aspects of addiction. 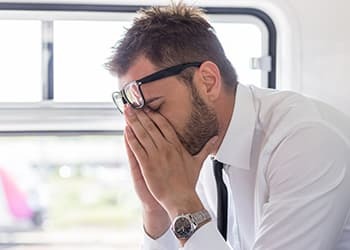 Cognitive behavioral therapy (CBT) techniques help you learn new sleep habits and stress-reduction techniques, while counseling addresses emotional concerns, such as anxiety and mood swings. 12-step programs: Twelve-step programs, such as Narcotics Anonymous, or All Addicts Anonymous, help you address your dependence under a set of established support guidelines, often with an added spiritual perspective. Various forms of aftercare may also be important to prevent relapse and help you maintain sobriety. Work with your therapist or another addiction professional in your treatment program on an aftercare plan that works best for you. When you stop using Ambien, your brain may struggle to re-establish normal levels of activity without the influence of the drug. In most cases Ambien withdrawal may range from a few days to several weeks. 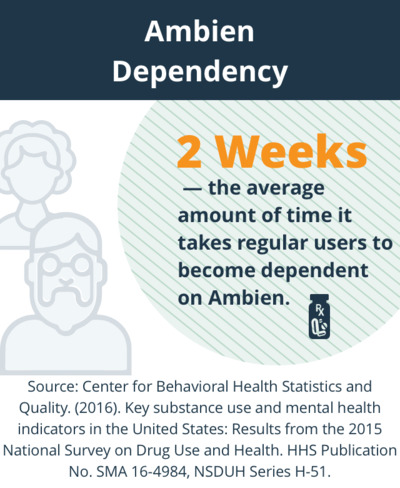 If you took Ambien CR (controlled release), you may experience a slightly longer withdrawal period since the drug remains in your body longer than the short-acting dose. To minimize withdrawal symptoms of any type of Ambien, establish a taper schedule with your physician. Heavy users – those who took larger doses for a longer period of time – usually experience more intense, longer-lasting withdrawal symptoms than mild users. An especially lengthy, “post-acute” withdrawal syndrome (PAWS) has been noted in some heavy Ambien abusers. First 4-8 hours: Severe users may begin to notice mild withdrawal symptoms. 24-48 hours: Users will typically begin to fully experience withdrawal symptoms (such as difficulty sleeping, craving, anxiety, tremor, heart palpitations, delirium and sometimes seizures or psychosis) from 24-48 hours after their last dose. Some people experience seizures during Ambien withdrawal. Quitting Ambien cold turkey is potentially dangerous. Suddenly quitting without supervision can increase the risk of experiencing difficult withdrawal symptoms. One of these symptoms – severe seizure – have resulted in a few reported fatalities. Medically assisted detox is a safer alternative. A physician can help you gradually taper off Ambien and may temporarily prescribe other medications, such as longer-acting benzodiazepines, the benzodiazepine antagonist flumazenil or certain antidepressants, to help ease withdrawal symptoms, manage insomnia and minimize other forms of discomfort. The biggest benefit of quitting Ambien is that you can regain control of your life and your sleep. Recovery from Ambien abuse can greatly benefit your long-term mental and physical health. You may feel trapped by your use of Ambien because of the difficult withdrawal effects you encounter when you try to quit on your own. You may feel there is no choice but to continue the drug, regardless of any problems, or side effects, use may cause. Successfully recovering from an Ambien addiction can put an end to the compulsive cycle of drug use to merely prevent the arrival of insomnia and other withdrawal symptoms. Withdrawal symptoms aren’t the only troubling feature of Ambien abuse. Many Ambien abusers also experience a wide range of harmful side effects, including performing unconscious activities while sleeping. These activities can include eating, talking on the phone and driving. One user even reported sexually assaulting his roommate with no conscious recollection of the event. Quitting Ambien can help you avoid these side effects. Guild or shame over Ambien use and associated behaviors. Ready to quit Ambien? Here are some suggestions you might find help helpful as you begin the process of getting off Ambien and staying clean. If you’ve been treated unsuccessfully for Ambien addiction, if your current addiction is very serious, or if you’re concurrently abusing other drugs in addition to Ambien, the intensity and immersive environment of an inpatient rehab program may benefit your recovery efforts. Talk to your doctor or a mental health professional about your addiction. Follow your doctor’s guidance to taper off Ambien and allow your brain to adjust slowly to normal. Attend Pills Anonymous meetings, or join another kind of support group. Regularly remind yourself why you are choosing to quit Ambien. Work with a professional to identify and address any underlying emotional problems. Use your support system and talk through your craving for Ambien. Learn to recognize and avoid cues, such as any thoughts, feelings or emotions that will make you want the drug. Minimize general stress in your daily life. Speak with your prescribing physician about referral to a sleep therapist, who can assist with non-pharmacologic improvements for good sleep hygiene. See a counselor to learn stress reduction techniques, such as deep breathing and guided meditation. Establish a routine sleep schedule. Find ways to fall asleep without Ambien, such as substituting warm milk, or using soothing sleep tapes. Manage and distract yourself from Ambien cravings by establishing a nighttime ritual. Practice healthy habits, such as routine exercise, playing sports or taking up a hobby. Many people addicted to Ambien do not recognize they have a problem because their doctor prescribed the drug. Talking with someone about a potential problem may help them determine the severity of the problem and if it requires seeking Ambien dependence treatment. Here are some ways to approach someone who may have a problem with Ambien. Approach the person 1-on-1 before attempting an intervention with several people, which can be intimidating and cause the user to become defensive. A personal conversation improves your chances of getting through to the person. Do not confront the person with judgment, anger, blame or threat – these are menacing attitudes that will not help and may make matters worse. Be genuinely compassionate, gentle, caring and helpful. Show that you are coming from a place of concern rather than judgment. Explain why you are concerned about the addictive behaviors. Bring up specific behaviors or incidents that have personally affected you or others in your circle. Encourage them to seek Ambien dependence treatment. If they are not responsive to your suggestions, consider seeking a professional who can help stage an intervention. If the person chooses to seek treatment, stay involved and offer support when possible. Learn to let go if and when necessary, and remember only the person is responsible for his or her behavior. Will I Get Rebound Insomnia if I Quit Ambien? How Long Does It Last? Rebound insomnia is the most common withdrawal symptom when ending Ambien use. Because Ambien is a drug designed specifically to treat insomnia, stopping its use means the insomnia will return, often worse than before. With proper management, normal sleep can return within a few days to a few weeks for those with a mild Ambien addiction. For those with moderate to severe addictions, insomnia may persist for several weeks to a few months. Encouragingly, most people find that their quality of sleep improves after the withdrawal period. Recognizing that you may have a problem with Ambien can be an important step toward recovery. If you need help quitting Ambien or want to get help for someone you care about, speak with an admissions consultant at a treatment center of your choice. How long you’ve taken Ambien, how much you use, and how often. Whether you’ve been abusing other drugs. Any medical or mental health disorders that will also need treatment. When you can enter treatment.